Seasoned with over 2 decades of successful recovery outcomes that started in 1993 with Life Management Foundation. The mission of Serenity continued onto the summer mountain Capital of the Philippines, Baguio city in 2007. Serenity is a leisurely 3 hour drive North from Manila and nestled among the clouds 5000 feet above sea level. It is an Ideal getaway for the lowlanders who desire to recover in cooler climates, and for families who want a breather from the distress of addiction, at least until their dependents get with the program. Serenity in the Steps services include voluntary treatment programs, mentor-ship, recovery coach training, advocacy, Employee Assistance Programs, family inclusive or codependency programs, medical tourism and other programs. ﻿Over the years, we have seen that clients who are able to discern their purpose in life have been able to achieve long lasting recovery. Our counseling philosophy is grounded in humanist principles of UPR (Unconditional Positive Regard). We tailor fit evidence based approaches like CBT (Cognitive Behavioral Therapy), MET (Stages of Change), Behavioral and NLP to achieve treatment goals in a client-focused and then client-centered environment. The program includes not only leading the clients to the road of recovery, but also to train them to become addiction counselors and/or certified recovery coaches. The task of helping others is a way to maintain their own newly found recoveries. Voluntary treatment programs for alcoholism, gambling and substance use disorders. Such programs depend on client's willingness towards self-healing & recovery. Our presence assures quality treatment & recovery services for the afflicted, in an environment that cherishes personal dignity and our natural ability to change. S I G N E D M ﻿O﻿ U ! Serenity is the Official ICCE Colombo Plan Education Provider for the Philippines. 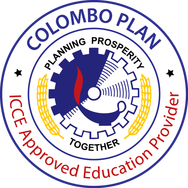 The Colombo Plan’s International Centre for the Credentialing and Education of Addiction Professionals (ICCE) is the training arm of Colombo Plan Drug Advisory Programme. ICCE was established with the aim of training, credentialing and professionalizing the addiction treatment workforce around the world. ICCE conducts credentialing examinations in order to provide addiction treatment professionals with the credentials that show that they have the necessary skills, knowledge and competence to treat addiction. 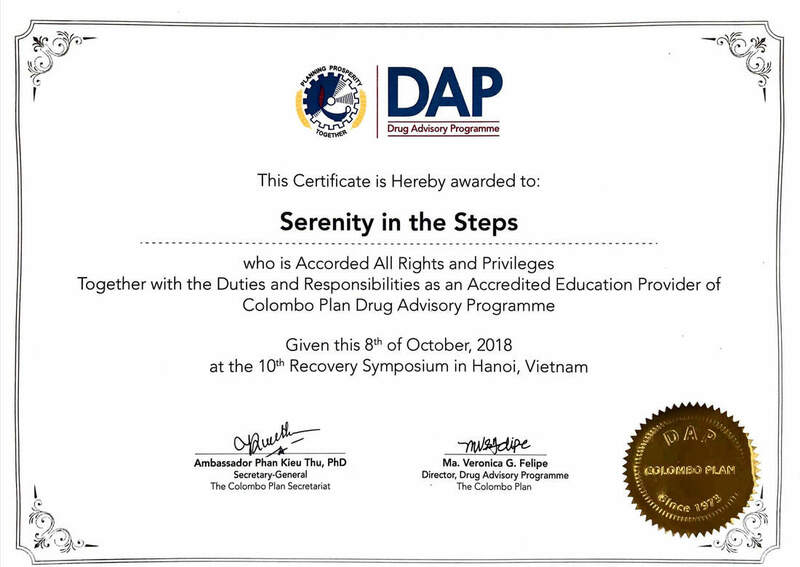 With its cadre of PRC licensed counseling professionals, ICAP's, (Internationally Certified Addiction Professionals), Certified Recovery Coaches and NCAC (USA Nationally Certified Addiction Counselor) who are themselves in recovery, Serenity in the Steps is now offering the opportunity for Philippine addiction stakeholders to be internationally credentialed and globally recognized thru the above mentioned training and certification programs. Copyright 2007-2019 Serenity in the Steps. All Rights Reserved.